Consumers are digitally savvy, eager to experiment, minimally loyal, and can switch allegiances and spend rapidly and without regret. The pace of digital innovation — driven by new entrants and established players — further fuels those behaviors. To win, you need to get inside the adoption and use behaviors, buying preferences, and overall motivations of your customers. Consumer Technographics® provides broad and industry views of customer behaviors and adoption and use patterns, allowing you to better understand and anticipate their actions and expectations. In-depth behavioral, qualitative, and social listening insights by industry that help you better understand your customers and their behaviors and attitudes. Emerging technology, social media, and mobile trends and adoption data to inform go-to-market strategies and new product opportunities. Consumer purchase journey data so you can refine product positioning, messaging, and content to resonate with your target audience. Unique opportunities to provide custom consumer data for your business needs, drawing from our primary research and Consumer Technographics data. Consumer Technographics delivery is personalized to your needs, providing the consumer data you care about. 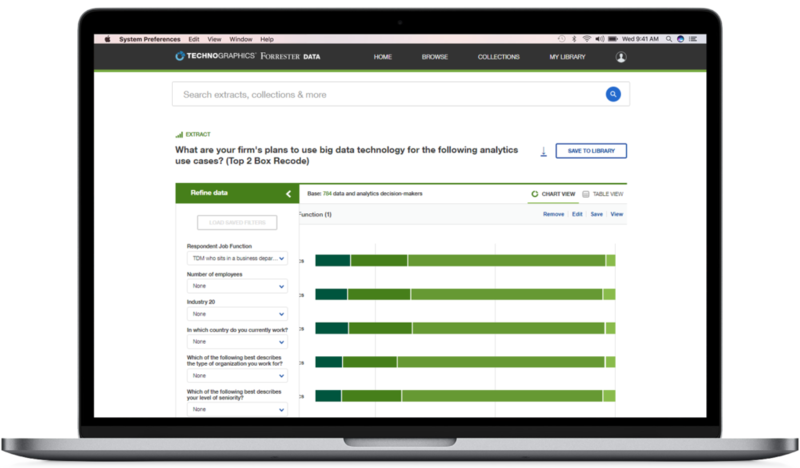 Forrester’s Data Insights team will help you examine and analyze your customers’ digital, mobile, social, financial, and retail behaviors. Enjoy an interactive experience in our streamlined digital platform. Thank you for contacting us. A Forrester representative will be in touch with you soon to schedule a demo of the Consumer Technographics Digital Platform.